A comparative analysis of the efficiency of adaptive spatial filters with different methods of classified training sample formation under conditions of simultaneous exposure to active noise and passive interference is carried out. 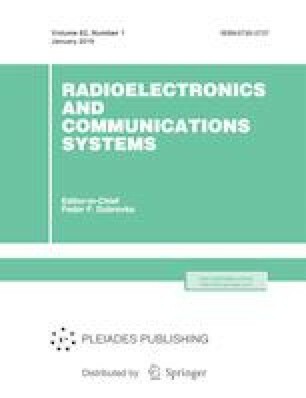 Based on the proposed methodology, analytical calculations of the changes in interchannel phase shifts for discrete algorithms for the adaptation of the weight coefficients of the spatial filter in various modes of operation of the 36D6 radar are carried out. It is shown that interchannel phase desynchronization/error arise at pause intervals in the adaptation of weight coefficients during antenna system scanning. The magnitude of these desynchronizations depends on the angular velocity of the antenna system rotation and on the repetition period of the radar pulses. An estimation of the suppression coefficient realized at the end of the pause in the adaptation of the weight coefficients taking into account the interchannel phase desynchronization is carried out. The recommendations on the choice of the formation method of the classified training sample under the conditions of the combined interferences are considered taking into account the losses that arise in case of discrete adaptation of the weight coefficients of the spatial filter. Russian Text © D.M. Piza, D.S. Semenov, S.V. Morshchavka, 2019, published in Izvestiya Vysshikh Uchebnykh Zavedenii, Radioelektronika, 2019, Vol. 62, No. 1, pp. 8–15.